and click on the matching picture. Connect the right contraction of the words. Memorize the words for 5 animal in 8 languages. 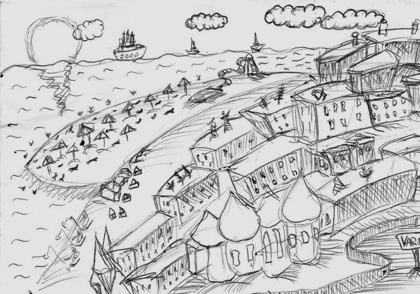 Free online learning games about English and foreign languages. Language games to teach foreign languages and practice communication skills. More than 15 online games and excercises, for teaching popular languages, words, spelling and grammer, that may be used for fun, interactive education and examination. The language knowledge games are small online games, up to 1 MB, which include puzzles, mosaics, tile games, interactive excercises, skill games and tests for learning English, Spanish and German language words, alphabets, spelling and language rules. The language learning games are suitable tools for education, examination, references and recreation. They may be played in schools, at home, in classes and help you learn and study foreign languages. Minute to win it games. Fun educational games. English learning games. Language games to explore and study the language skills. English Alphabet Puzzle - Arrange the letters in the English alphabet by number. Animals Words 1 - Find the correct word of the animal in 8 languages. Spanish Alphabet - Sort the letters in the Spanish alphabet by number. German Alphabet - Arrange the letters in the German alphabet by number. Bulgarian Alphabet - Place the letters in the Bulgarian alphabet by number. English Animals - Point and click the right animal in English. 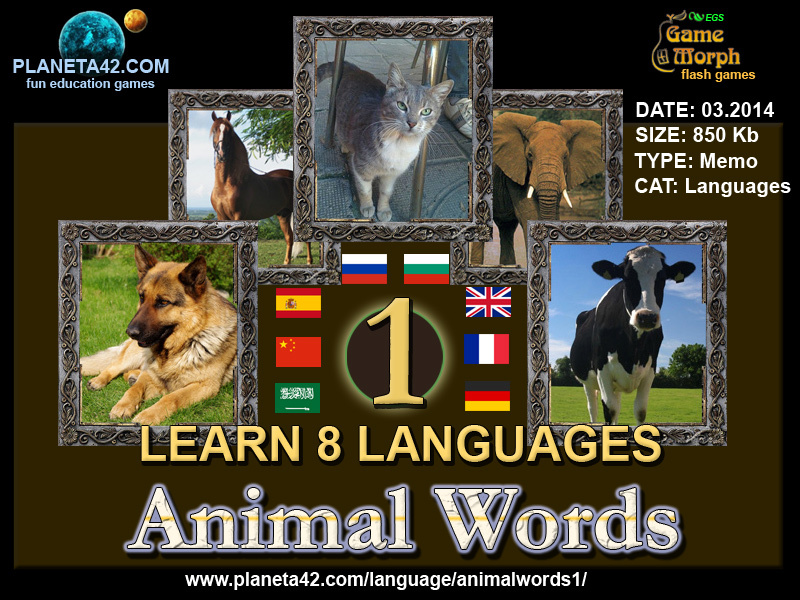 Spanish Words for Animals - Point and click the right animal in Spanish. German Words for Animals - Point and click the correct animal in German. Apostrophes Puzzle - Connect the right contraction that indicate the omission of the letters. P42 Language Library. Interactive Language Learning. The "Interactive Language Learning" is a free online education web site with short games, tests and puzzles to teach and practice langage skills in a fun engaging way. The language class games may be played online in the web browser, or be downloaded for using without internet. All games are free and run on medium class computers, tablets and laptops, with installed flash player. They reward +1 Knowledge Level for every won game. Fun language educational games, suitable for e-learning, online lessons and interactive classes. The collectible games (download versions), goes with build in player, but the levels are not saved on Planeta 42 website. Educational Multimedia Languages for all ages. Free to play and download without registration. Fun language games. Language Puzzles - This collection includes small online leraning games to drag and drop words, letters and pictures and complete different language exercises. Example game is the English Tenses Puzzle, where the pieces connect the tense with a correct example sentance. Language Mosaics - This collection includes short educationsl games to arrange pictures on their correct pattern. Example game is the Grammar Tree, where pictures of grammatical rules need to be arranged like fruits on a tree. Language Arcade Games - This collection includes fun online games that are mainly played with the keyboard to test or learn some grammatical rule or concept. Example game is the Irregular Verbs Tetris, where mowing with arrow keys, you need to send the English verb in the corect basket. 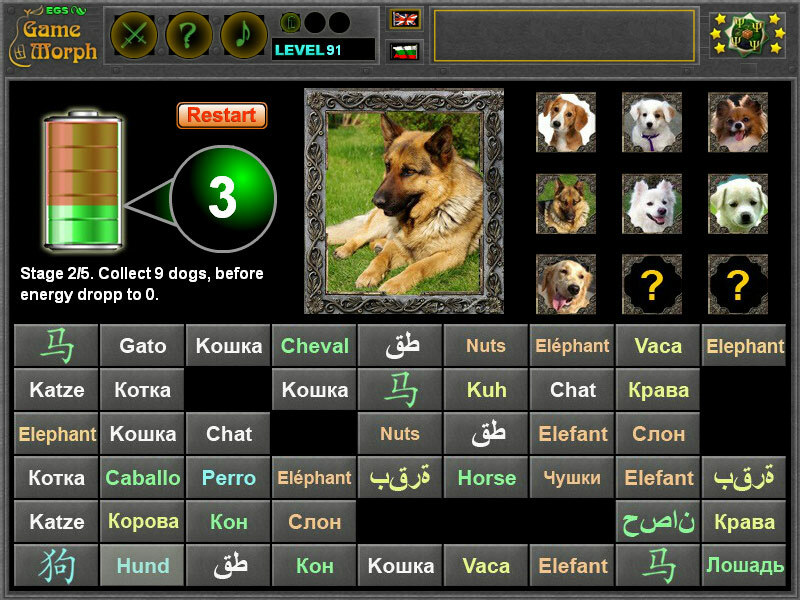 Language Skill Games - This collection includes language learning games with words and pictures separated in tiles to remove or collect and exercise language skills. 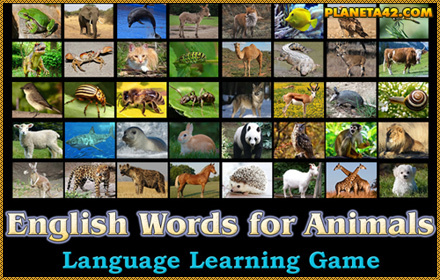 Example game is the first part of 5 Animals for 8 Languages, or the word practice games. English Learning Games - This collection includes all language learning games to teach and study English language. Spanish Learning Games - This collection includes all language learning online games to teach and study Spanish language. German Learning Games - This collection includes all fun language learning online games to teach and study German language. Alphabet Games - This collection includes all available alphabet puzzles, where you need to arrange the letters of the alphabet in numerical order. Word Games - This collection includes all language games to match an image with a word for popular languages. Example game is the English Animals, where for a given time you need to find the picture of the animal. Language Tests - This collection includes online tests with integrated evaluation system to exam language skills and knowledge. 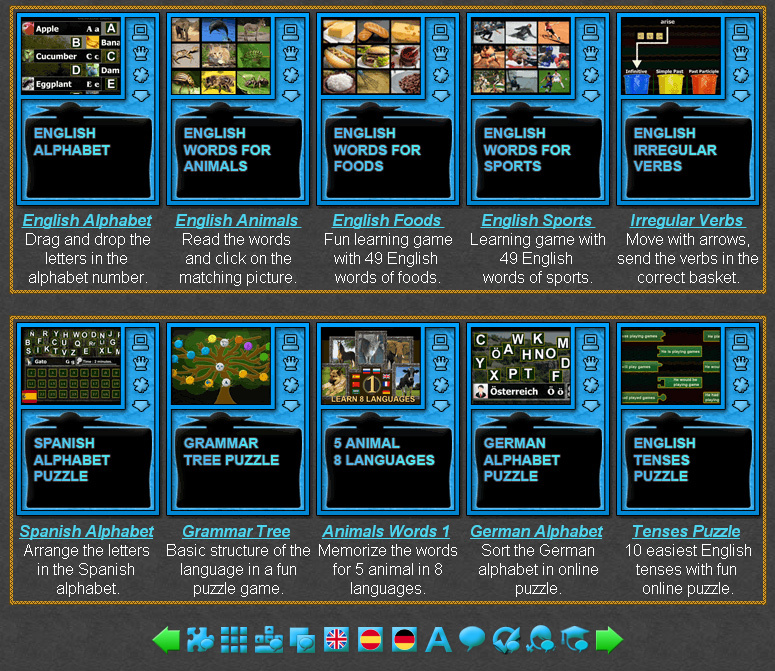 Also all games for examination of language skills, competence and abilities. Language Games for Kids - This collection include all language educational games suitable for kids and pupils in 4-8 grade. Interactive Language Learning for Kids. Language Games for Students - This collection include all language educational games for 9 grade and above, suitable for students and adults. Interactive Language Learning for Students. The Interactive Language Learning website include: fun language learning games, fun educational language games, online language learning games, online educational language games, fun school games, online school games, language learning activities, free educational foreign language games, vocabulary games, free learning english games, free school games, english lesson games, online educational games to learn english, free online games, fun english educational games, fun online games, fun english learning class games, english games, interactive online english classes, interactive knowledge boards, Language knowledge boards, interactive classes, knowledge games for foreign languages, english tests, online tests, online english tests, english classroom games, english learning games for adults, english games for kids, english games for middle school, english games for adults, improve language skills, english games, high school games, english games for kids, language games in classroom and more than 15 online games and excercises, for teaching popular languages, words, spelling and grammer, that may be used for fun, interactive education and examination. Here is the blog with the Remarkable Collection of Language Games.